This continues a previous post, which became overwhemingly long. The subject is whether recently published Be-10 production rate data from Meredith Kelly and others (from Quelccaya, Peru) and PH Blard and others (from various sites in Bolivia) agree with each other. In the last post, I calculated a reference sea-level, high latitude Be-10 production rate from the Kelly data. Now to determine whether this is consistent with the Blard et al. data. This is a bit tough to do, because the Blard papers don’t directly compare Be-10 and radiocarbon ages on the same landform — they compare He-3 and radiocarbon ages from one landform, and then compare He-3 and Be-10 concentrations from a different site. In order to compare the Kelly and Blard data correctly, it’s necessary to reduce them to a common location using the same calculation method. The two papers used different calculation schemes (Kelly basically used the code from the online exposure age calculators, whereas Blard et al. used their own code). Thus, I will use the online exposure age calculator code to reduce the Blard data, as follows. Based on the discussion in the previous post and a recent paper by Nat Lifton, I’ll disregard the De, Du, and Li scaling schemes and consider only the St and Lm schemes. First, we need to assemble the He-3 data from the first Blard et al. paper, which reports He-3 concentrations from an independently-dated alluvial fan (the “Pocolli Fan”) at Tunupa volcano. I use the data from Table 2 in the first Blard et al. paper, use weighted mean concentrations of replicate analyses, and take the independent age of the fan to be 15260 +/- 500 cal yr BP. I exclude TU-104 as is done in the paper. I could not find rock densities mentioned in the paper, so I used a guess of 2.7 g/cm3. I could not find in the paper any estimate of boulder surface erosion rates, so I assume zero erosion. A spreadsheet containing these data (as well as the Uturuncu data from the other paper) is here. Second, I use the MATLAB code from the online exposure age calculator to find a best-fitting reference production rate for He-3. This requires modifying the code used for Be-10 exposure age calculations by removing radioactive decay and production due to muons. Otherwise it is the same. The assumption that there is no He-3 production due to muons is not easily verifiable, but it is not very important for this application. I used the NCEP reanalysis elevation – height relationship used by default in the online exposure age calculator. This yields best-fitting reference production rates of 137.8 +/- 4.3 (3.1%) for the St scaling scheme and 128.9 +/- 4.4 (3.5%) for the Lm scaling scheme. In the Blard paper, they computed this using various scaling schemes and paleomagnetic data and obtained similar results, so we are in agreement here. MATLAB code to do this calculation can be found at this address. Run the file ‘Blard_He3_calib_wrapper.m.’ You’ll need many of the files in that folder as well as a lot of the v 2.2 code from the online exposure age calculator. Third, I now diverge from the procedure of Blard et al. At this point, they multiplied these reference He-3 production rates by the Be-10/He-3 production ratio observed at the Uturuncu site to obtain reference Be-10 production rates. However, this assumes that the production ratio is invariant with altitude. The code in the online calculator assumes that the ratio of spallogenic production of Be-10 and He-3 is constant with altitude — they obey the same scaling relationship. However, total production of Be-10 in the online calculator code includes production by muons. Thus, given that we have assumed zero production by muons for He-3, the code in the online calculator predicts that the ratio of the total Be-10 production rate to the He-3 production rate will vary slightly with altitude, because muon production varies differently with altitude than spallogenic production. The point of all this is that to do this comparison exactly precisely correctly with the online calculator code, a different procedure is needed. This involves, first, using the He-3 production rate calibrated from the Tunupa site to determine the He-3 exposure ages of the samples at the Uturuncu site; second, using these exposure ages as independent age control to estimate the Be-10 production rate. The MATLAB script ‘Blard_He3_calib_wrapper.m’ computes the He-3 ages of the Uturuncu boulders. The script ‘wrap_P10_fit_Uturuncu.m’ uses those ages to calculate reference spallogenic Be-10 production rates. Unfortunately, I could not locate sample thicknesses or shielding factors for the Uturuncu samples in the Blard et al. paper, so I used 3 cm thickness for all (the average thickness of the Tunupa samples) and assumed zero shielding. After a slight hiccup because Be-10 concentrations are incorrectly given in units of 10^5 atoms/g in one of the tables (instead of the correct 10^6), this procedure results in reference production rates for Be-10 of 4.06 +/- 0.21 (5%) for the St scaling scheme and 3.79 +/- 0.23 (6%) for the Lm scaling scheme. Thus, these are the reference Be-10 production rates that should be used to compute Be-10 exposure ages based on the Tunupa and Uturuncu calibration data using the online calculator code. Blard et al. found a 5% uncertainty, so we are basically in agreement. Note that if we had simply applied the He-3/Be-10 ratio that Blard et al. computed (33.3) to the reference He-3 production rates 5 paragraphs ago, we would have obtained 4.14 and 3.87, respectively, which are similar but slightly higher because they would reflect a reference total Be-10 production rate rather than a reference spallogenic production rate as used in the online calculator code. This issue is largely irrelevant at high altitude where production due to muons is relatively unimportant, but it’s necessary to keep these separate when using the online calculator code. One additional point here. Note that the procedure I’ve just gone through requires using a single scaling scheme throughout: you must use the same scaling method to compute He-3 production rates from the Tunupa data, compute He-3 ages for the Uturuncu samples, and compute Be-10 production rates using these ages. This is particularly important because the Uturuncu samples are a lot older than the Tunupa samples, and large magnetic field intensity changes are predicted to have occurred in the intervening time period. When we calibrate He-3 production rates using the Tunupa samples (15 ka) and use them to generate ages for the Uturuncu samples (30-70 ka), the Lm scaling scheme predicts large production rate changes between 0-15 ka and 15-70 ka, but the St scheme does not. 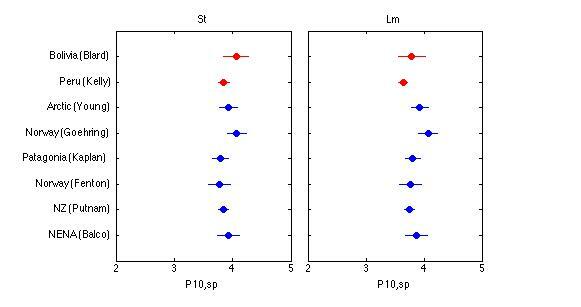 Thus, exposure ages for Uturuncu samples calculated using these two scaling schemes, even with the same calibration data from Tunupa, are very different (32.7 – 68.9 ka according to the St scheme; 29.9 – 58.9 ka according to Lm). Although we expect based on first-principles physics that a time-dependent scheme should perform better for this purpose, we have no way of verifying that without additional calibration data from older sites. All of this highlights that even if we have good calibration data for late-glacial-age high tropical sites, this does not necessarily mean that we can calculate accurate exposure ages for much older samples. Finally, we can get on to the point of this post which is to compare the new high tropical calibration data sets with each other. I will do this in a couple of ways. One, here is a plot that simply compares reference Be-10 production rates computed from the Kelly and Blard data sets with those computed from other, high-latitude/low-elevation, calibration data. This is the same as the plot in the last post, only for just the St and Lm scaling schemes, and with the Blard data set added. This shows that both scaling schemes (with the NCEP reanalysis atmosphere approximation…it is important to remember that there is also an atmosphere model involved) can successfully reconcile the Kelly and Blard tropical data with each other (which is not that difficult because the sites are all fairly close to each other) as well as with the high-lat/low-elv data. This is fairly encouraging. To look at this a different way, here is a plot that shows apparent exposure ages computed using the Kelly/Quelccaya calibration data and the measured Be-10 concentrations at Quelccaya, Uturuncu, and also the Breque site of Farber et al. There is no particular significance to the fact that they are plotted against elevation. We can then compare those to the true ages to get an idea of how well these sites agree with each other. This plot is generated by the MATLAB script ‘calc_all_tropical_ages.m.’ Basically, the conclusions I draw from this are as follows. One, the Kelly and Blard calibration data agree with each other. Two, given that the St/Lm scaling schemes and the atmosphere model are correct, the Kelly and Blard calibration data are consistent with the hypothesis that the Breque samples with the lowest Be-10 concentrations most closely approximate the true age of the moraines. Of course, they would also be consistent with the hypothesis that true measurement uncertainties for the Breque samples are larger than reported, and the average of all the Breque data correctly represents the moraine age. They do not appear to be consistent with the previously favored hypothesis that the Breque samples with the highest Be-10 concentrations correctly represent the moraine age, and the other samples have anomalously low Be-10 concentrations due to moraine degradation. This whole issue is of moderate historical interest and it is already discussed at equal length in the Kelly paper. Three, these data can also be used to estimate the scaling uncertainty that we should use when applying one of these production rate calibration data sets to determine exposure ages at unknown-age sites in the high tropical Andes. The nominal uncertainty in the production rate we get from using calibration data at a single site (as given above and in the last post, e.g., 2.5% from the Kelly data set) should be too small, because it doesn’t include any scaling uncertainty. If we assume that all the samples at the three sites shown in the plot above are typical, high-quality exposure-dating samples spread randomly throughout the high tropical Andes, then the scatter in ratios of apparent exposure age to true age at these sites is an estimate of the uncertainty we can expect in calculating an apparent exposure age in the same way for similar samples at an unknown-age site in the high tropical Andes. Following this through gives 7% scatter (the standard deviation of the ratios plotted above) for the St scheme, and 6.5% for the Lm scheme. For useful application, we need to parse this into measurement uncertainty and production rate scaling uncertainty. This can be done using the standard error propagation equation. If the total uncertainty is 6.5% and typical Be-10 measurement uncertainty is 3%, then the production rate scaling uncertainties are 6.4% and 5.7%, respectively. See also a paper by Young and others for a discussion of this issue. Thus, comparison of these data sets indicates that, if we use the Kelly or Blard calibration data to calculate exposure ages at unknown sites, we should assign a production rate uncertainty of ca. 6% when comparing these ages to events dated by a different method (e.g., late-glacial climate variations). Note that this conclusion isn’t particularly sensitive to whether the Breque data are used in the scatter estimation…using only the Kelly and Blard data results in production rate uncertainties, calculated similarly, of 5.5% for St and 4.9% for Lm. Summary: the Kelly or Blard production rate calibration data sets, when used to compute exposure ages of unknown sites in the high tropical Andes, should yield results that can be accurately compared to independent timescales if one takes the production rate uncertainty to be near 5% (Lm) or 6% (St). This represents pretty good progress relative to the previous situation of speculating about which boulders on the Breque moraine do or don’t have inherited Be-10. There’s one more thing to comment on. Kelly et al. also collected younger limiting radiocarbon ages as well as measuring Be-10 concentrations in boulder from a set of older moraines (the Huancane III) moraines — they are 17 ka vs. 12.3 ka. Given the production rate inferred from the younger moraines, the Be-10 concentrations in the older moraine boulders imply exposure ages that are less than the limiting radiocarbon ages. Thus, the data from the two moraines are inconsistent. In the paper, they pointed out that there are many fewer data (both Be-10 and C-14) from the older moraine, and they are more scattered, so it is not clear that these data really are contradictory at high statistical confidence. The INTCAL13 radiocarbon calibration also is different from the INTCAL09 calibration (used by Kelly) in the right direction at this time, which helps. In any case, they argued that the more comprehensive data set from the younger moraines is more likely to be correct. The comparison with the Blard data supports this. A citation! | The bleeding edge of cosmogenic-nuclide geochemistry.